The valley and mountains around Montrose offer hundreds of miles of excellent trails for those seeking backcountry bliss on ATVs, dirt bikes, rock crawlers and snowmobiles. Rustic roads and trails wind their way through these adobe badlands and canyons. Open, off-route riding is permitted in the Flat Top and Peach Valley areas. Both areas are located just north of Montrose and feature varied terrain that will challenge ATV and motorcycle riders of every skill level. There are more than 75 miles of designated trails and primitive roads in the remaining areas of the NCA. The 20-mile singletrack Sidewinder Trail is a recent addition to the Gunnison Gorge and is already popular with locals. It snakes in and out of canyons and is an expert-level technical trail for those on two wheels. The vast expanses of public lands on the Uncompahgre Plateau are a great place to combine off-roading with hiking, mountain biking, hunting and camping. For those who possess the right equipment and extra fortitude, the plateau is also home to some world-class rock-crawling routes. This backcountry byway meanders through 65 miles of spectacular peaks and narrow glacial valleys, including 12,000-foot passes and well-preserved mining remains of stamp mills, tramways and ghost towns. Portions of the route may be visited in normal passenger cars, but beyond these points the Alpine Loop provides exceptional off-road excursions. Tip: The snowmobiling season often starts as early as the first week of December and lasts through the first half of April — and sometimes longer. The most dependable conditions can be found right after Christmas until just about the middle of March. Pick up directions to these places and other tips at the Montrose Visitor Center. About an hour's drive from Montrose, Black Mesa has some of the most spectacular powder riding in the region. Sitting at an elevation of 10,500 feet, the Black Mesa offers groomed trails and thousands of acres of meadows and pine and spruce forests. The wide-open parks serve as race tracks for speed demon snowmobilers, and adrenaline junkies love to climb to the top of Baldy Mountain. Pick up directions and tips at the Montrose Visitor Center. Stretching an impressive 123 miles, Sunlight to Powderhorn Trail (“The SP” for short) is the longest snowmobile trail in the lower 48. Other Grand Mesa trails range from the calm Land’s End Loop to more experienced climbs. A few words of caution: Don’t skimp on supplies for a long ride like this one (and stay off the blue paths marked for cross-country skiers only). 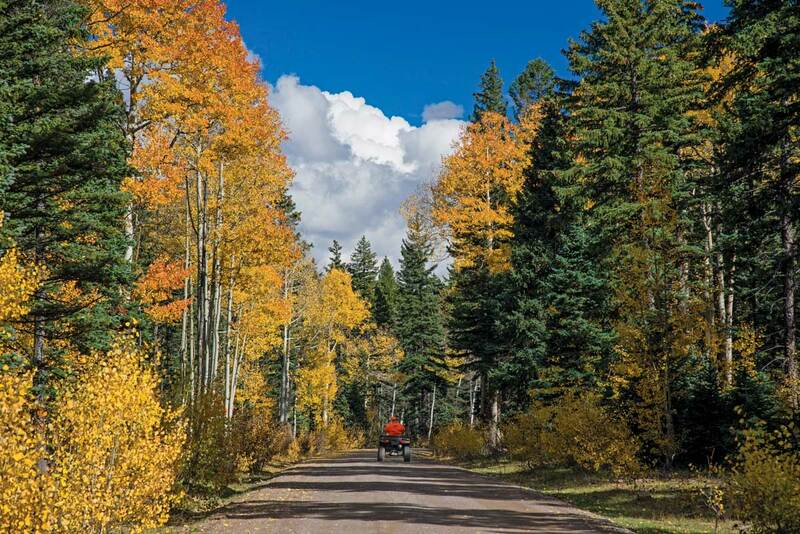 The 1.5-million-acre Uncompahgre Plateau is just a 30 minute drive from Montrose and is perfect for a day trip. Expansive spaces characterize the Uncompahgre Plateau, which offers tons of great intermediate riding on groomed and un-groomed trails and climbs that are not too steep. A version of this content originally appeared on visitmontrose.com.